It is that time of year; where folk (and particularly writers) go a little holiday crazy. 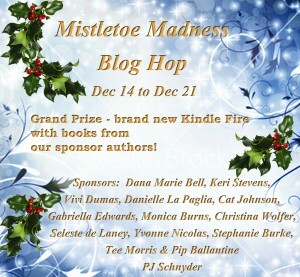 The Ministry is proud to be one of the sponsors of the Mistletoe Madness Blog Hop. All of the other fabulous sponsors can be found right here – so bounce on over. Full details and how to enter are on this page. At the bottom of this missive you will find details how to enter to win separate prizes from the Ministry. We’re dubbing it, a box of Ballantine and Morris. Hopefully you will be interested it that. 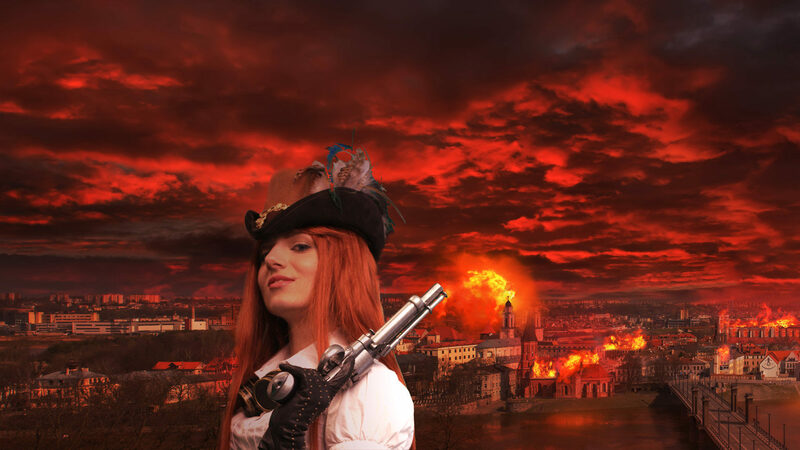 As for us here at the Ministry, well we are gearing up for a wonderful steampunk Christmas. We have already released Mr Tee Morris’ short story In the Spirit of Christmas, where our two agents Miss Eliza D Braun and Mr Wellington Books, encounter a spot of holiday bother. It came out this time last year as a free podcast, but has now made it in to Aether form. 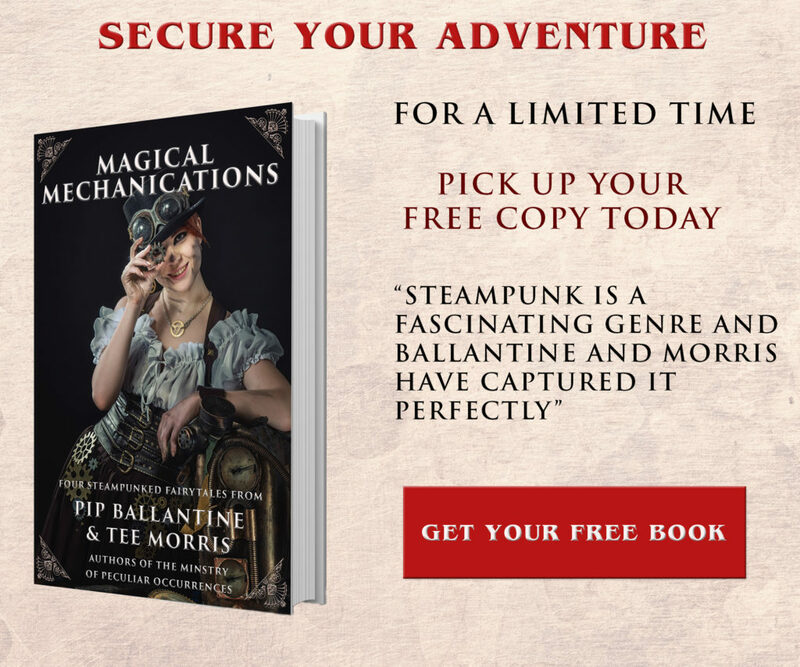 So once you have downloaded it to the device of your choosing, how else can you provide yourself with a steampunk Christmas? First of all, to get yourself in the mood, you couldn’t do better than watching this the Fright Before Christmas by the Ministry friends the League of STEAM. Then you may begin. First with the tree. These folk have created a wonderful Steampunk Christmas Tree and included some instructions on how to make some cog ornaments. This beautiful tree has taken the theme of the bowler hat which Mr Books prefers, and turned it into a marvellous tree. Also, Mr Books has taken a leaf from these creative folks, and made himself some literary themed trinkets for his home. And if you haven’t got a making bone in your body, then the wonderful folks over at Brute Force studios can provide you with a rocketship…or possibly the moon. I have even heard tell of Target doing a steampunk set with a moustache, a clock and a pipe. Very festive. And on top, maybe Santa. Don’t neglect the rest of the room though. These instructions show how easy it is to make a nifty steampunk take on the traditional paper chain. Do them in green and red for extra seasonal appeal. Don’t forget your friends and family far away. Miss Braun has quite an extensive family back in New Zealand and always makes sure to send them cards for the season, rather than some kind of aether greeting. Sending a steampunk themed card is bound to make them smile. You can make your own, or find something like this one. What to put under the tree can be quite the trick, even for a steampunk. 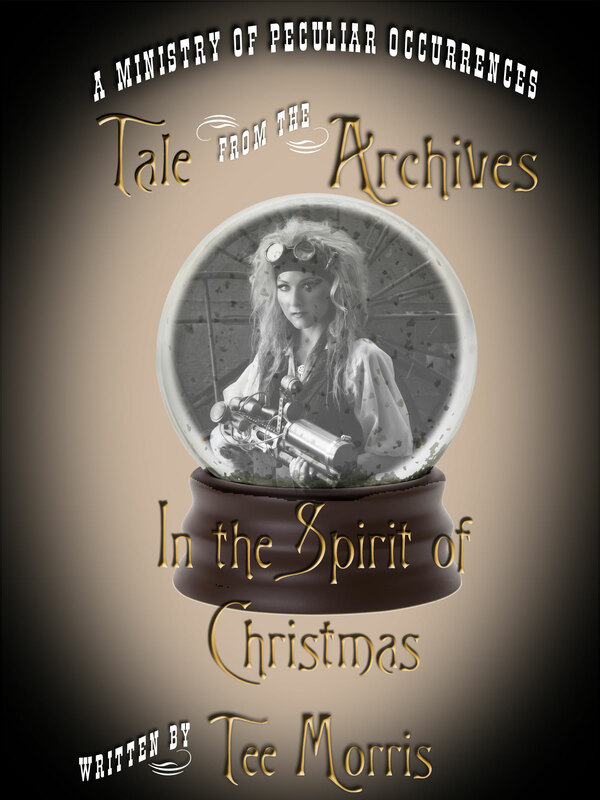 Goggles, corsets, a new raygun are all wonderful choices, but if you are looking for a perfect steampunk Christmas theme, then we have a couple of suggestions; a journal to record your thoughts just like Wellington Books. Miss Braun would say nothing says Christmas like a Tesla coil…so this snow globe containing one would be apt for her. All of which you could wrap in some charming steampunk paper. If you have the aether device called the ipad, then this beautiful application would make a wonderful gift for a devotee of Charles Dickens. A Christmas Carol, steampunk style, with interactivity and lovely illustrations. A most important part of any holiday celebration is always the food. Miss Braun loves to cook her Christmas pudding. For best effect it should be made in advance of Christmas, but even if prepared this very day, it will still be delightfully tasty. This happens to be Miss Braun’s favourite recipe. We hear that in America pudding means something different to a dense fruit cake, but rest assured nothing tastes more wonderful when covered in a small amount of brandy and set alight. Once doused, smother in a brandy sauce. There is nothing to be afraid of, and firemen should not be required..unless of course you are Miss Braun. Her puddings are somewhat more explosive. After dinner you will want to relax with your guests…so how about a spot of steampunk music for the season? Nothing could be better than a sample of the Men Who Will Be Blamed for Nothing. And last but by no means least, do not forget to hang some mistletoe somewhere…just in case there is an agent or two which you might want to kiss. (Miss Braun finds this particularly amusing, Mr Books does not). But however you celebrate the holidays or wherever you are, we hope you have a happy and safe season of goodwill. And good luck winning that Kindle that is on fire…oh sorry…the Kindle fire. On the way out, and before you shut the door, don’t forget to enter the Ministry’s own giveaway of a Box of Ballantine and Morris. 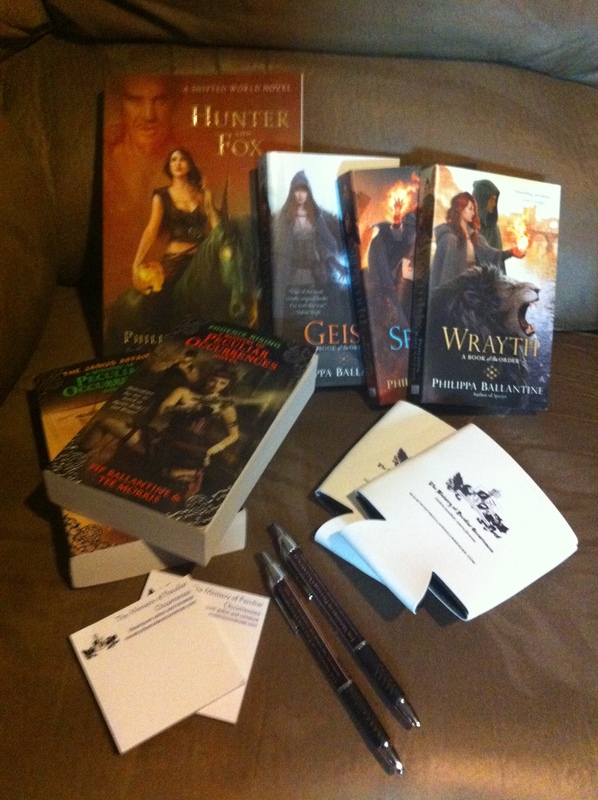 Books galore and something called…swag?? Lay your eyes on what is available! Merry Christmas and a Happy Happy!! thanks for the fun post and Happy Holidays! Excited to be entering in this contest! I love the music and great food of Christmas, and the celebration of Jesus’ birth that Christmas represents. I love spending time with loved ones, eating good food and relaxing (hopefully) in the sofa. And hug the ones we love, a bit longer this year. I love steampunk stuff. love you site. Happy holiday to you all. The hot mulled wine is my favorite! First time using raffle copter, so I hope this works. Back home we always celebrated the Twelve Days of Christmas, often leaving our tree up until way past New Years. The season was always heralded with the hanging of the greens in our 100 some-odd old church way up in the rafters. That was a building that could really creak in the wind and it certainly had its’ own voice. All of this would go on until near Ash Wednesday, I think, where we had the burning of the greens and all of those dried out cedar boughs got shot up in a great ball of fire depending on which way the wind was blowing. So many ideas! Happy holidays!! I’m working on a lovely pair of steampunk boots to go with the rest of my outfit. They have a nice pair of steam powered lifts on them although I’m afraid the mechanical doesn’t leave much room for my feet. Being able to see family and friends that I rarely get to see!! Merry Christmas! Thanks for the chance to win! What a fun post. Thanks for the chance and Happy Holidays! 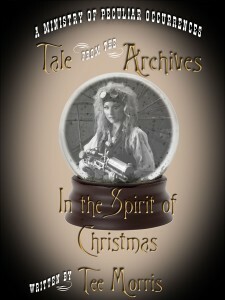 Enjoyed reading this very unique steampunk Christmas feature! Awesome videos! Thanks for sharing them. Interesting intro to a steampunk Christmas. love the quiet moments with family, the beauty of the lights and the laughter of shared stories while the smell of fresh baked cookies and spiked hot coco/spiced cider fills the house. I love the lights, music and food of Christmas. I also really enjoy spending time with family. Thanks for the instructions and the great giveaway! I love looking at all the Christmas lights and decorations. Steampunk is new to me but I came and seen and recovered. Merry Christmas! Fun post and fun sounding party! Thanks for the giveaway! ….forgot to say I love all the baking and decorations!!!!! What I love about the season is being with my family. I love being with family, the sparkly lights, the food and the music. Ah, Christmas in the age of Steam . . . when no one’s grandmother had been run over by a reindeer, when neither dogs nor pigs sang Christmas songs, when stores did not play endlessly looped renditions of odes to snow from “Beverly Hills, L.A.” . . . when Charles Dickens could scare the oats out of people with a story of a financier’s Christmas . . . How could one not love it? Oh, to answer the request: What I love particularly about Christmas is hearing a church choir sing (“Gesu Bambino,” for example) in an almost-midnight Christmas Eve service, with low ambient lighting and candles everywhere. I love the gathering of family from far and near. It’s the only time of year that we get to give each other hugs and kisses and meet our newest members. My favorite thing about this season is cookies. I love to bake, eat, and share cookies. Happy Holidays,thanks for the chance to win.Nice blog hopping with you. I love the decorations and the music! I love the decorations and the food. Thanks for all the awesome info! I love baking and decorating the tree and buying presents! I love looking for gifts and wrapping them. Thank you for the chance! my fav part of the season is the big holiday dinner! I love the decorated houses, and stuffing stockings and watching some holiday movies and the music and being with my kids. Well, this is all very fascinating. I will have to peruse it again at leisure later. Thank you for the giveaway and joining the blog hop. Happy Holidays! Being with family. Opening presents and seeing their happy faces and mine. I love giving gifts and making yummy goodies. For me, the holidays are about family. Spending time with one another, smiling, laughing, even if there aren’t presents under the tree. As long as my family’s with me, my holidays are set! I love the holiday season for the opportunity to look back over the year and reflect on the good that has come and the better yet ahead of us. Not to mention entering contests for great stuff! I love PRESENTS! Giving them, that is 😀 One of my favorite things about December and Christmas is being able to pick out fun gifts that I know people will love. 🙂 Thanks for the giveaway! I love seeing my friends’ and family’s faces when they open their presents 🙂 Thanks for the giveaway! Happy Holidays!